Sun, surf and sand will rule your days on Grand Bahama Island, however, live entertainment, music and evening activities will spice up your nights! Between scrumptious fine dining and cocktails, sunset cruises and shows, as well and many Bahamian cultural events, the island still has plenty to offer once the sun goes down. The Junkanoo Parade pays tribute to an important period in Bahamian history. During the days of slavery, slaves were permitted three days off; January 1st, December 25th and December 26th. The Junkanoo Festival would take place on December 26th and January 1st, while the 25th of December was dedicated to exchanging gifts and visiting friends. For a great selection of nightly events and popular Bahamian music, set your sights on the Count Basie Square in Port Lucaya Marketplace. Keep your feet moving to the traditional sounds of Rake ‘N Scrape, the folk music of The Bahamas and explore the deeper meaning of Calypso music. Out with your family? Port Lucaya Marketplace offers tons of fun to visitors of all ages. 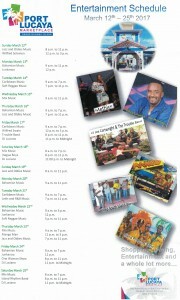 Try a game of BINGO or Bahamian line dancing. Bahamians love karaoke! While you search for late-night entertainment, you’ll find an abundance of venues and bars hosting karaoke nights. Go ahead – step up to the mic and expand your vocal horizons during your Grand Bahama Island vacation. The Sunset Cruise & Show features three hours on Freeport’s largest catamaran, eating delicious hors d’oeuvres, sipping wine and enjoying romantic, live music. Add a glorious Bahamian sunset and you’ve got yourself a most memorable Grand Bahama Island experience. For more information or to book your sunset cruise, visit Superior Watersports. Every Friday night, you can visit Count Basie Square in Port Lucaya Marketplace for an evening of unforgettable native entertainment featuring fire and limbo dancing, live bands and performances by the Grand Bahama Island’s top performing artists. Show starts at 8pm.